1) We get to catch up with our friends and family. 2) We all down tools and stop working because you can’t work when you have visitors, right? That’d be so rude. 3) Because we live ‘way out there’ people tend to ring before they come, so I get the heads up a car is going to come down the drive in an hour or two. 4) Due to the aforesaid ‘heads up’ I can try out that new cake recipe I’ve been dying to make all week. 7) In winter we all gather around our huge open fire and it’s just so cosy. 8) I get to use my beautiful coffee machine quite a few times after the Moscarto bottle is empty. 10) We find out my eldest son has stolen all the marshmallows meant for hot chocolates, which whilst I curse him at the time, is rather good because otherwise I’d eat all the rest. Ahem. 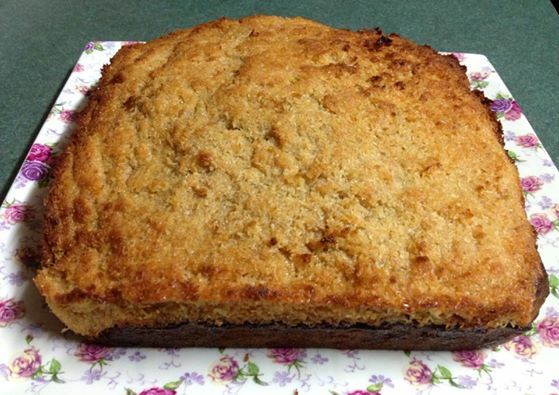 This last Sunday afternoon, my cake recipe of choice was a Cinnamon Tea Cake, which due to the fact I added too much milk (another story entirely), only ended up ½ inch high. Sigh. What to do? I needed another option otherwise my baking reputation would be in complete tatters. Enter the Lumberjack Cake … Ta DAAAA. And wasn’t it the most amazing and decadent delight to make. All those yummy bits of apple and dates wrapped in spongy comfort and topped with a layer of crusty coconut. Swoon. It was just to die for and the cake was big enough that there were leftovers for smoko the next day for the pesky marshmallow-stealing son (do you think he deserved it?) along with H (he loved it). Tip: The cake takes a while to cook so give yourself plenty of time. 1. Preheat your oven to 180 deg C. Grease a 20cm square cake tin and line the base with baking paper making sure to extend it up at least two sides (so you can grab cake out later). 2. Place chopped apples, bicarb, chopped dates and boiling water into a bowl and stand for 5 -10 minutes (10 mins is apparently better according to mum’s notes). In the meantime, beat the butter, white sugar and vanilla until light and fluffy. Add the egg and beat again. 3. Fold into the creamed mixture and alternately the apple mixture and then flour, apple mixture then flour until all is combined. Spread into prepared cake tin and bake for around 50 minutes. 4. Topping: Mix together butter, brown sugar and milk in a small saucepan over low heat long enough to melt the butter and dissolve the sugar. Take off heat. Add the coconut. Spread over cake with a butter knife and then put back into oven to bake for another 30 minutes. Keep an eye on it so you don’t burn the coconut. 5. Let cake sit in tin for 10 - 15 minutes and use the paper to gently lift out of the tin and onto a wire rack. Peel paper carefully from under cake and leave to cool. I cut mine into squares to serve. Sounds delicious, Margareta. Apples always make cakes so lovely and moist.